The Big Agnes Lynx Pass holds its own when compared to the best backpacking tents out there. Loaded with practical features, it's designed to optimize comfort for you and another sleeper. 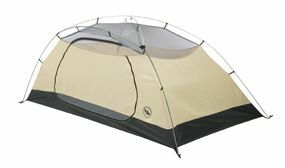 And as usual, you can expect topnotch Big Agnes quality as far as durability is concerned. The $200 you'll spend on this rugged tent isn't a lot to ask considering how well it performs. Don't take our word for it, though. Let the tent do the talking. If you're looking for a great 1-person tent, you might check out the Lynx Pass 1. It's basically the same as the 2-person variety, just a wee bit smaller and a few dollars less. The smart combi-pole design keeps the tent walls from sagging, giving you over three feet of headroom at the highest point. The tent is nearly five feet wide, which is plenty of room for two to sleep, albeit a bit cozily (but not nearly as cozy as something like the Big Agnes Seedhouse tent, which requires you to practically sleep on top of your tent mate). Be warned though: It's not the lightest backpacking tent on the market. But with the pieces and the footprint (sold separately) split between you and a friend, you won't feel the least bit bogged down. Floor Size: 90 x 58"
Packed Size: 7 x 21"
Vestibule Size: 17 sq. ft.
As with other Big Agnes tents, the Lynx Pass features strong DAC poles made of lightweight aluminum. Grommet webbing at the corners, buckles and plastic clips combined with the hubbed, color-coded poles ensures an easy setup, even with the sun going down on the mountaintop. The combination of materials helps the tent breathe and keeps you dry, even in a downpour. Even better: the storm flaps over the zippers means water won't sneak in around the door edge. The interior features mesh pockets for your gear, plus there are gear loft loops, giving you the option of adding an organizer. And boy is that nice when out in the backcountry! There aren't many drawbacks to speak of, although some users mention a tendency for water to condense on the floor. The biggest shortcoming is the number of vents. 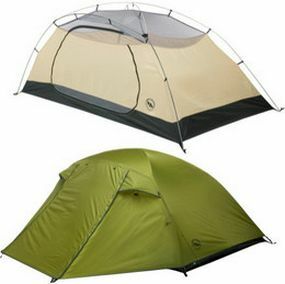 Compared to other three season tents, which typically feature 3 or more, then Big Agnes Lynx Pass 2 tent only has 2 vents when the rainfly is pulled over. These vents reduces airflow and ventilation. Although there are lighter 2-person tents, the size, space-efficient design and durable construction of the Big Agnes Lynx Pass 2 will merit your approval. The tent is easy to set up, has a decent amount of interior space for its weight and, most importantly, is effective at keeping you safe and secure three seasons a year. MooseJaw - We're really starting to love the guys and gals there! Amazon - Nothing wrong with them. They got everything these days! Have you used a Big Agnes Tent? Share your Big Agnes camping tent reviews and let us know how it worked for you!